I was apprehensive to write this report. I feel very fortunate to experience unique trips like this and I’m rather reserved in sharing. However, I made a new friend last year named Dan Solin. Dan is a former trial attorney and converted investment adviser and now an author. I had met Dan at a conference, and he gave me one of his books. One of the chapters is about happiness and fulfillment. That chapter has inspired me to share my “happy” experiences in hopes of providing encouragement to others to find theirs as well. Here’s to Dan. 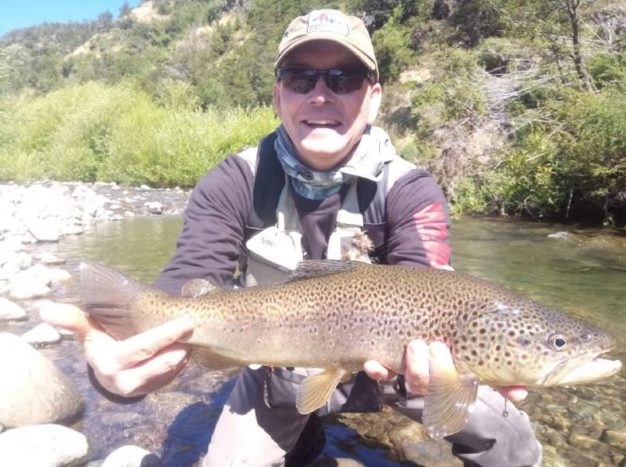 This is my second trip to the Patagonian region to fly fish for an assortment of rainbow, brown and brook trout. Trout were introduced to this region in 1907. Still to this day, the waters are pristine and clean. During my stay I never saw a plane in the air. At times I felt like Lewis and Clarke as they ventured into the Northwest. There is low to moderate fishing pressure, and with the Southern hemisphere being Summer, it was a good break from our North American winter. Those that know me well, know that I’ve been married to a wonderful Brazilian lady named Noelia for more than 30 years. She is from Southern Brazil in the state of Catarina. Her city is called Florianopolis. 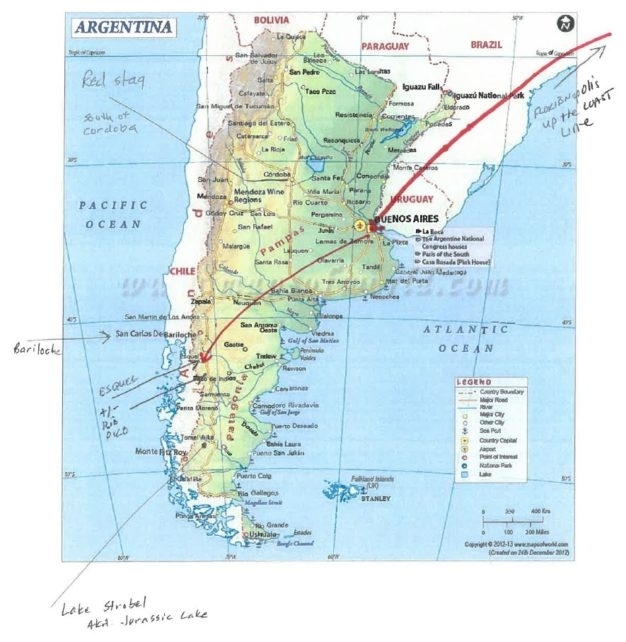 It so happens it is 2 plus hours North of Buenos Aires, Argentina (BA). My trip starts by returning to Brazil to visit my happy and loving in-laws on Feb 1, 19. This year, I had ten days with them on the island of Florianopolis. On a Monday afternoon I boarded a flight direct to BA. BA has two airports and I flew into the smaller airport called Newbury. I needed to spend the night in BA, as there is only a daily flight to my next destination, Esquel. 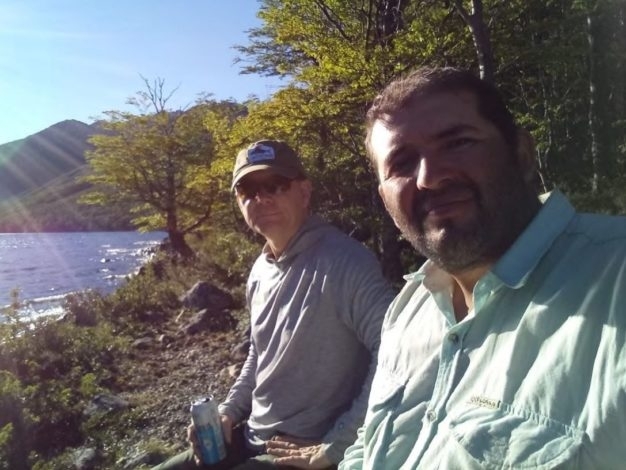 The next day I caught a flight at 11am to Esquel, two plus hours later I arrived and was met by my outfitter, Justin Witt. I had conversed with Justin for more than a couple of years planning my two trips to his location. However, this was the first time I had met him in person. Justin can be described as a tall, lanky and lean Georgia boy with no ascent. Fly fishing and traveling are his passions. Justin is the most free-spirited person I have ever met. The primary genesis of his free spirit comes from a near death experience at age 24, when he survived a brain aneurysm. From that, he left the traditional world of work and business and has since followed his passions. 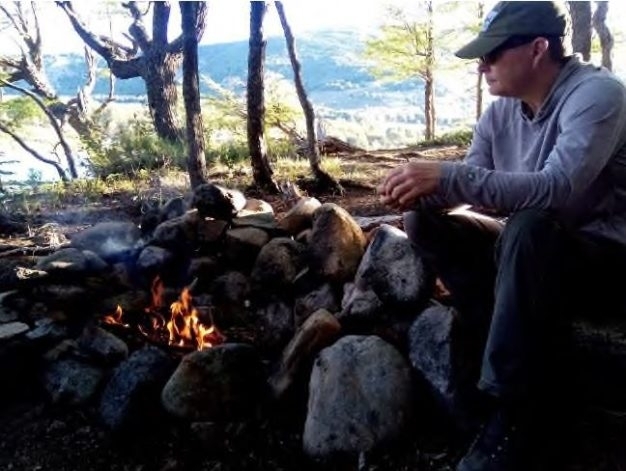 More than 12 years ago, Justin walked 1200 miles with only a backpack for 7 months through the Patagonia region and determined the best fishing was in Rio Pico. After gathering my gear, we walked to his 1997 Toyota red van with Chilean license plates. There waiting for us was his wife Khadizhat and his three-year-old daughter Aya. Khadizhat is from Russia and another super interesting person. She speaks four languages. I conversed with her in English rather easily and she talked with the locals in Spanish. Khadizhat and Justin met in the Peru by chance one evening. Within a month they both happened to be in India and reunited. 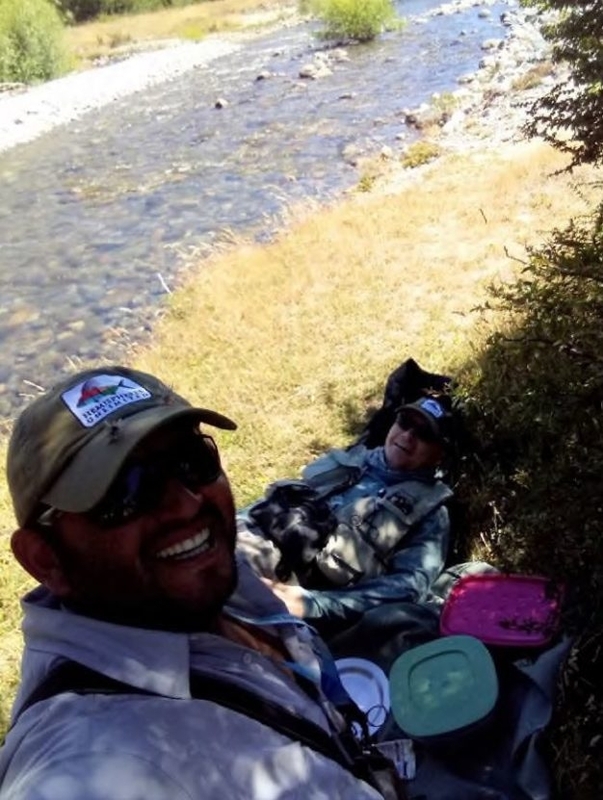 She has given up her business career living in Southern California to follow Justin around the globe guiding nutty fly fisherman to Mongolia, Russia, Alaska, Argentina and many other locations. 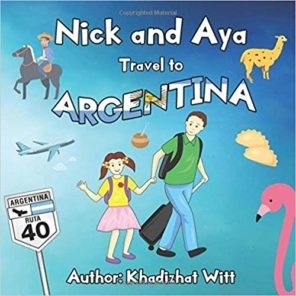 If you ask Khadizhat where they reside, she will say, “Where we are today.” If you want to purchase educational children’s books for family, I endorse you to find her series “Nick and Aya travel”. Go to Amazon and search for her by name. The two books I read were called “Nick and Aya Travel to Argentina” and “Nick and Aya Travel to Russia”. They give young children a different perspective. We left Esquel airport and drove for 2 ½ hours to a small town called Rio Pico. We traveled South through an arid landscape but as we got closer to Rio Pico the Andes came into view. Rio Pico sits 10-15 miles East of the Andes and 135 miles South of Esquel. Fishing for trout in this region is done in one of three types of waters. There are lakes, rivers and spring fed creeks. During this trip, I chose not to fish the lakes. The largest fish are in the lakes. Last year I caught a handful of 4-8 lb browns and rainbows in the lakes. 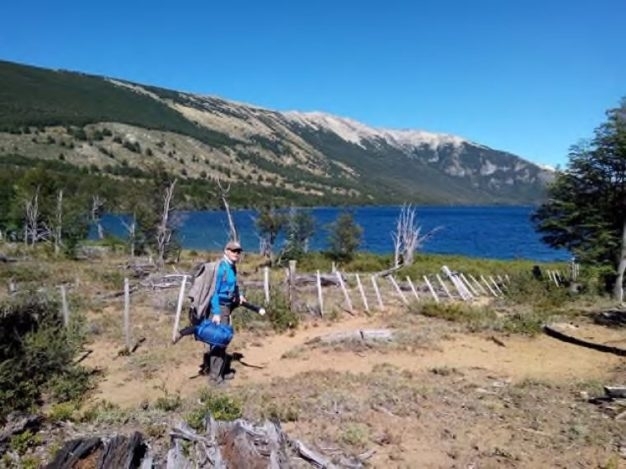 However, it is windy in Patagonia and a day on a windy lake isn’t as enjoyable for me as working miles of river. I’m reunited with my wonderful friend and guide Guille Willhuber. His first name is phonically pronounced as “Gee shay”. I call him G for short. My favorite river in this region is a smaller river called Nielsen. It dumps into the larger Rio Pico river. G took me to the upper Nielson, a location I hadn’t fished before. 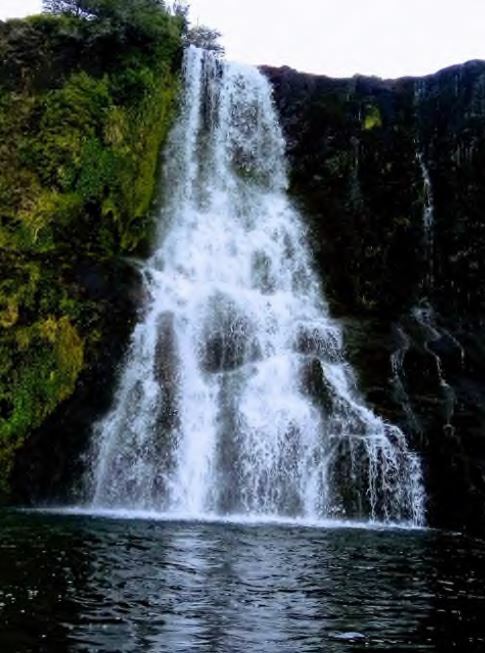 We started by walking down a forty-foot trail and as we traversed down, we could hear the waterfall that makes this location spectacular. We fished down river and then back up river. In all I would estimate we covered 2 miles in both directions. I caught more than 40 fish for the day. 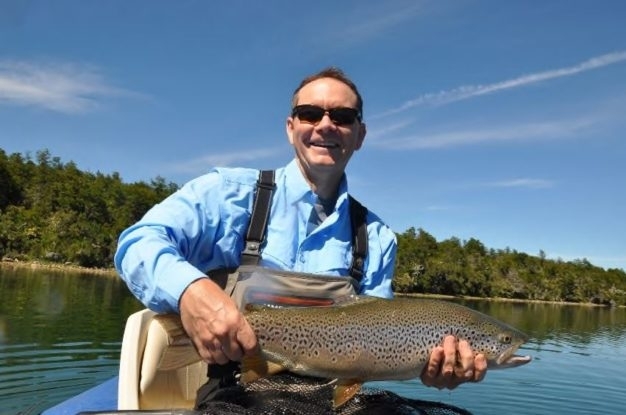 They ranged from a couple of 17-18-inch browns to 10 or more of 13-15-inch rainbows. I caught all of them on dry flies. 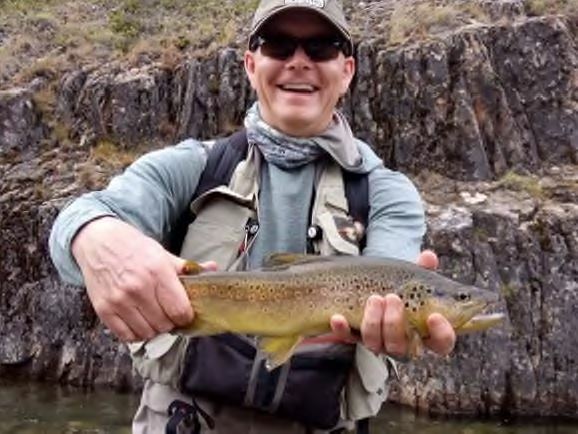 In Patagonia, everything is catch and release. The Rio Pico is the main river in this region. Fishing was below average for me during the day, however, the other two fishing guests (from Montana) were 1-mile up river from me and had a fabulous day. That night we had lamb done over an open fire pit. I also experimented with some fabulous Argentine Malbec. incredible. I lost count after 40 fish last year. This year with the water down the fish were smaller. However, I landed 10-15 rainbows in the 11-13-inch range. I missed 4-5 larger browns. Justin and Khadizhat had gone to a lake up river from Berta to set up camp for G and I. We arrived after an hour drive and a 30-minute hike. This is an untouched wilderness. This river can have 3-8 lb brook trout. However, the water levels were down, and the large fish remained in the lake. That’s fishing luck. We spent the night at the river, and I had a camp fire dinner. Thinking about the wonderful day and how good it would be to have a beer with my peanuts, when G asked me if I’d like to have a cold beer? Are you serious? You brought beer! We had originally planned to fish more of the Berta and a tributary. However, with the wind and low water I asked to return to Rio Pico and fish Camp Creek. Camp Creek is also known as Spring Creek and Christmas Creek. It is a spring fed tributary. This would be my first time. It isn’t far from the town of Rio Pico; however, it was a very windy day. 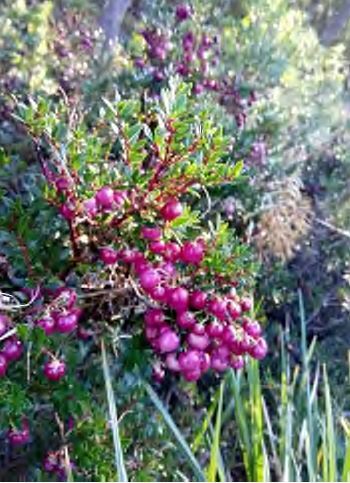 Spot and stalk fishing are the tactic in many Spring Fed creeks, and we used this successfully. 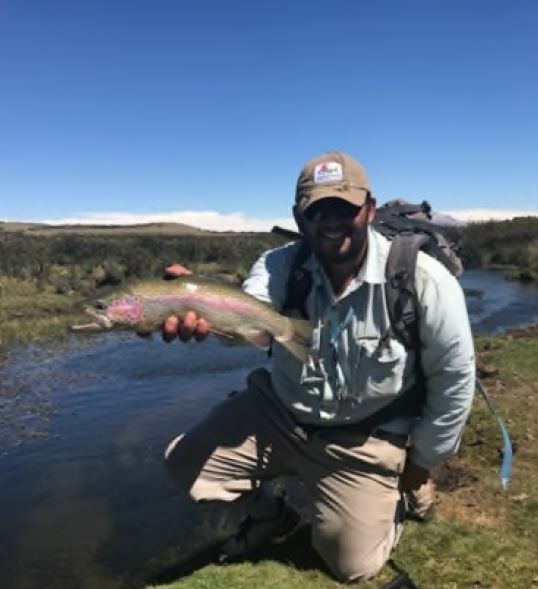 I was able to land a beautiful 19-inch rainbow (see below) on a small caddis fly. I caught a handful of other small fish, however, the wind made it challenging to make accurate casts. 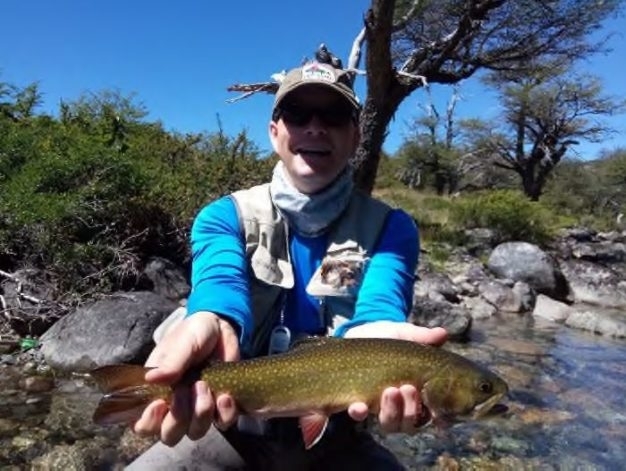 We returned to the Rio Pico river and received permission to fish a stretch that was owned by Justo Avilez. 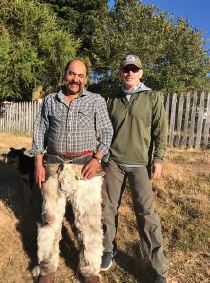 Justo is a real “Gaucho”. I had a wonderful day as I used a crane fly or what is referred to as the “Mackay special” from Idaho. G had never seen the fly before or the technique. 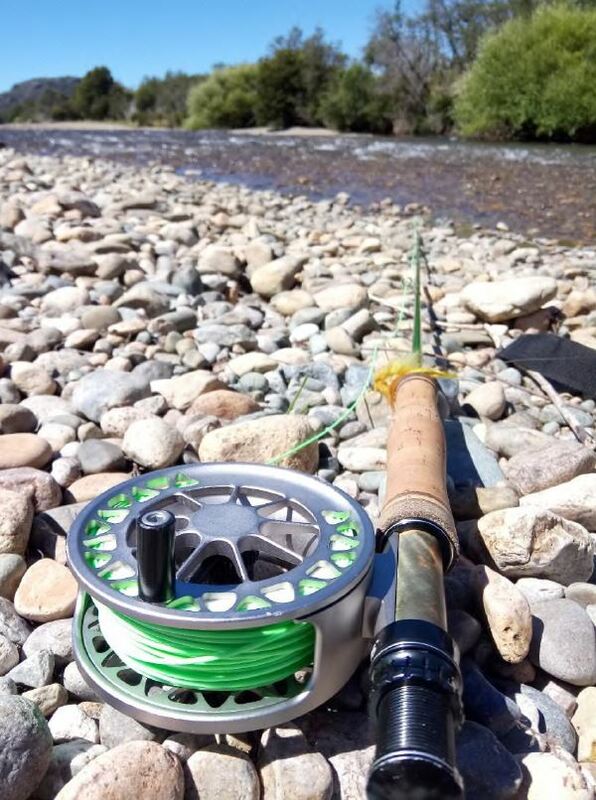 I cast down river and tossed the fly to the other side of the current and allowed the current to take the fly across the busy water. I landed 6 rainbows in the 13-14-inch range that were replicas of each other. I also missed as many as I landed. The highlight of the day was a 19-inch Rainbow and a 16-inch Brown. My last day we fished the upper middle stretch of the Nielsen. This was a new part of the river for me. The morning started slowly, however, we were all alone on this special river. By the end of the day, we had walked four miles fishing up river, which means we walked 4 miles back to the truck. However, as the day continued the fish started getting active. I caught more than 35 fish, mostly rainbows. However, the prize of the trip was a 20 plus inch Brown on a small caddis fly. I was able to watch the fish come from the bottom of a large pool. It slowly with confidence approached the fly like a shark. After successfully setting the hook, it came out of the water at least 2 feet high on three occasions. I will always remember G’s excitement yelling “Veddy Gud Ty, Veddy Gud”. It took a while to land the large fish, but it was the icing on the cake for G and me. Newburry and caught transportation to EZE, the large international airport in BA. It is a 45-60 minute trip depending on traffic. From there I boarded my trip to Atlanta around 9:30pm and 9 plus hours later landed in Atlanta. The final day started at 4am PST on Wednesday 2/20/19 and I arrived in Kennewick on Thursday 2/21/19 at 6pm after 38 hours. to assist you in booking flights and accommodations. She is from Argentina, and lives in CA. She knows the system and the lay of the land.